Photographs copyright © by Paul M. Remfry. 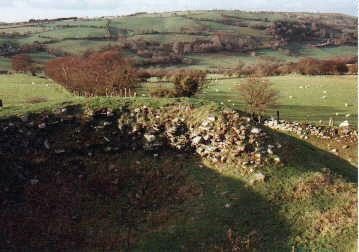 Above: view of a ruined tower of Cwm Camlais looking north. 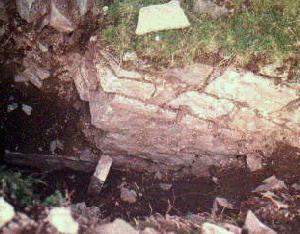 Cwm Camlais was a small castle, also known at times as Camlais, Maescar, Blaencamlais, or Defynoch Castle. Very little of its structure now remains, but enough to show that its rocky motte supported a round tower, and that the only outer defence was a counterscarp bank. Apart from a reference that it was destroyed in 1265 (and apparently never repaired), the history of Cwm Camlais is uncertain. 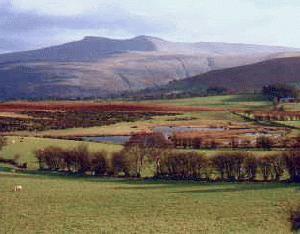 Another record is of a "new castle beyond Brecon" built by Llywelyn ap Gruffydd, Prince of Wales, and this quite likely refers to Cwm Camlais Castle. Below: the beautiful view south to the Brecon Beacons from the turfed over tower of Cwm Camlais (left), and a shot of the gateway to the tower as it was excavated in the mid 1980's (right).